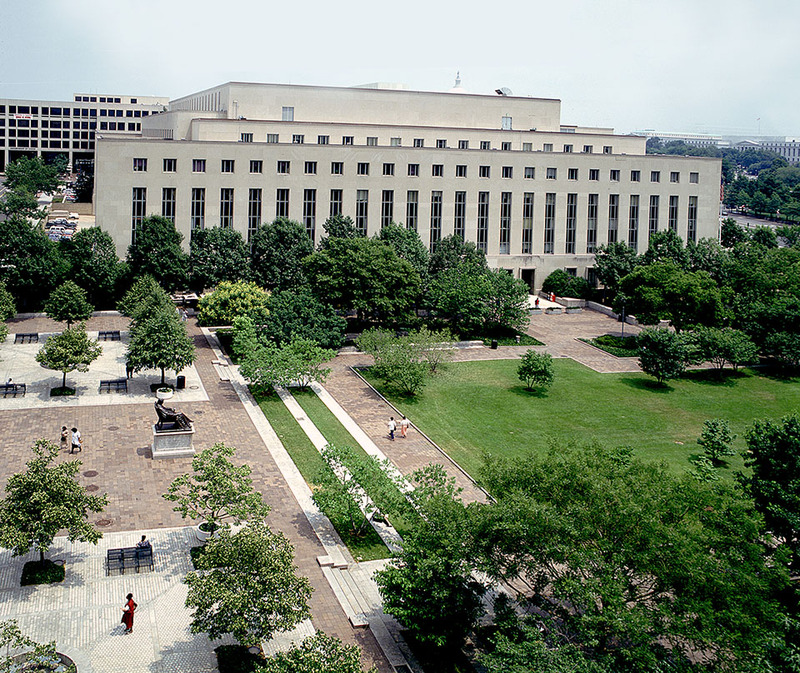 CRJA-IBI Group designed John Marshall Park, located between Pennsylvania Avenue and C Street beside the U.S. Court building and the Canadian Chancery, with flexible space to accommodate large crowds attending a variety of Capital events. 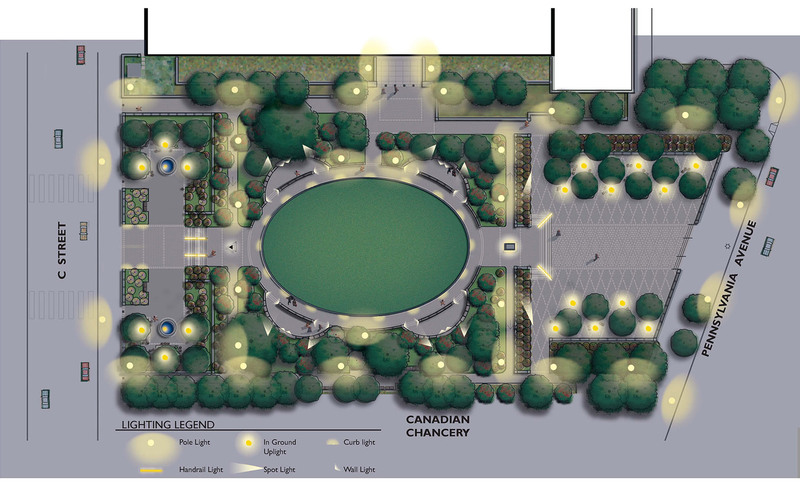 The design concept of the park utilizes a twelve foot grade change across its length to create three distinct areas: a lower tree bosque, an upper tree bosque and a garden area in the center. The upper and lower bosques are paved plazas of which the center is kept open to maintain the vista to the Old City Hall. 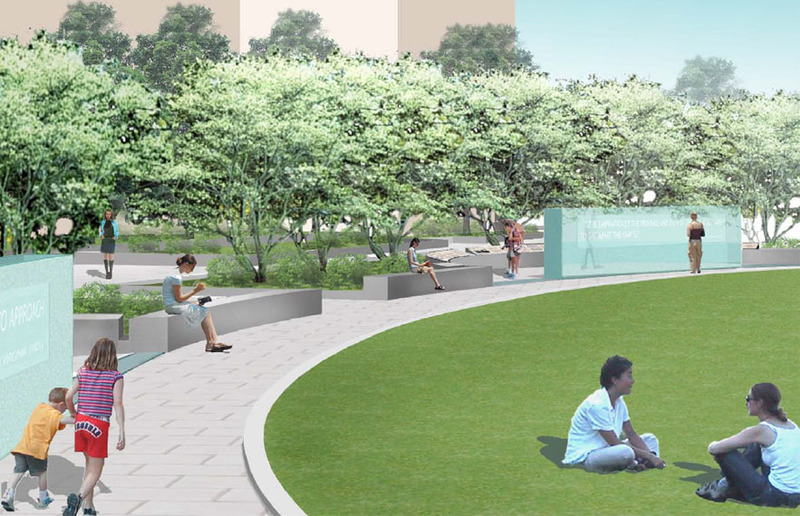 The sides of the plaza are heavily planted with trees where benches and walls provide sitting. In the upper bosque the benches and tables are arranged around two small fountains. The garden area in the center also maintains the axial central vista. It is set apart from the bosques by grass sitting terraces and the richness of its planting. Ramps on either site give easy access to C Street, the Court House, and the Canadian Chancery and the garden room itself. Fountain sculptures are by the artist David Phillips. Full-sized figures of chess players by Lloyd Lillie are seated overlooking the garden on the terraces where other chess boards are available for the public. 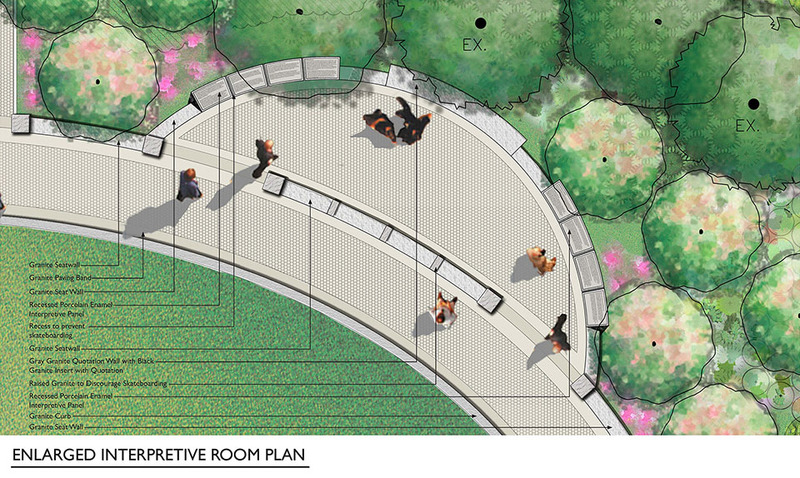 In 2006, the John Marshall Foundation approached CRJA-IBI Group to re-design John Marshall Park. The design transforms from its current configuration to focus on the life of Justice Marshall and the impact of his long tenure as Chief Justice of the Supreme Court. 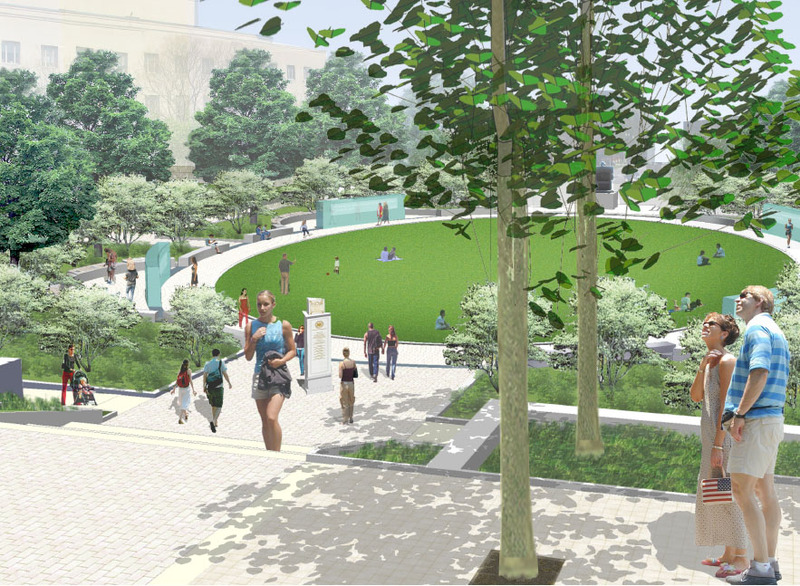 The park design will convey the lasting impact of our only “Founding Father” who served in all three branches of the U.S. government, who defended the Constitution as the framework of our government, and who gave the Judiciary branch of the government equal power with the Executive and Legislative branches. 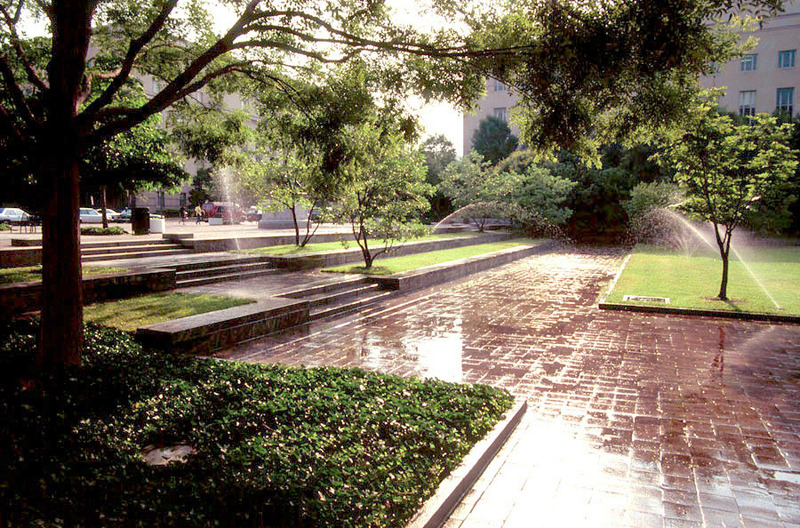 In order to achieve these goals, the park is organized into three terraces. The first along Pennsylvania Avenue draws people into the park and is the forecourt for the relocated historic statue of John Marshall. 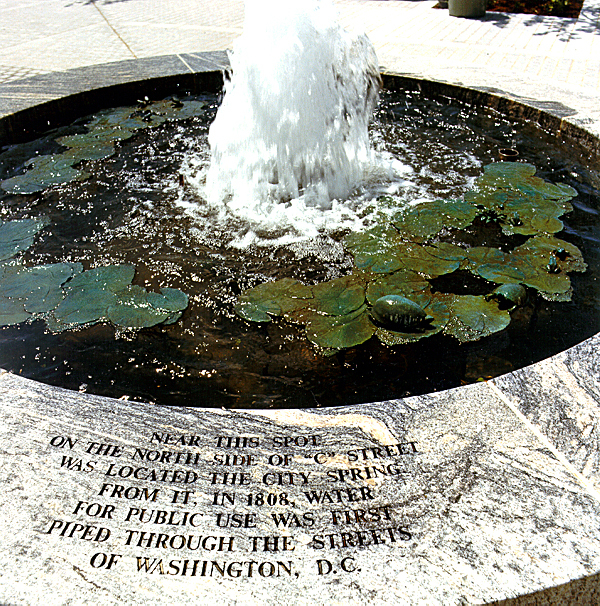 Along C Street, a small plaza invites visitors into the park and provides seating and space for gathering around two restored fountains. The central part of the park focuses on Marshall’s lasting impact through his Supreme Court decisions. 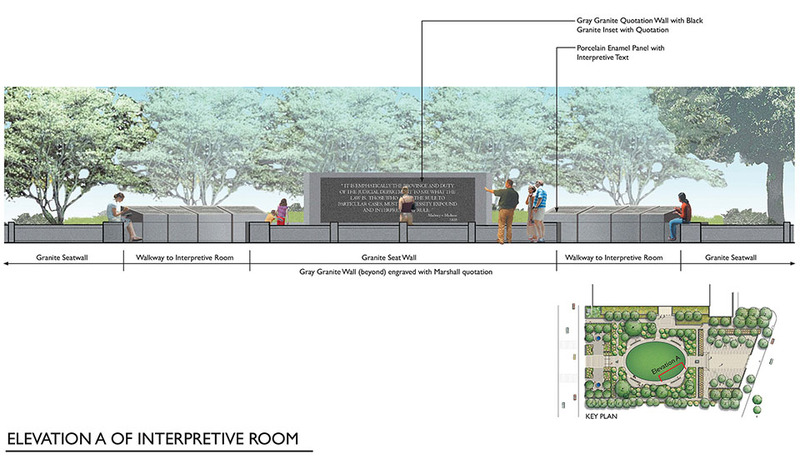 Inscribed granite walls allow visitors to grasp the importance of these decisions within a more contemplative space. Additional interpretive information about Marshall’s career and life are integrated into the design.